NullOutputStream is used to eliminate I/O overhead during the test. The following micro benchmark issues 1,5 million logging statements to CLASS_INFO and 30 million statements to NO_CLASS_INFO logger. The latter one places some static text instead of dynamically generated class information. First 1/3 of iterations were discarded to allow JVM warm-up. 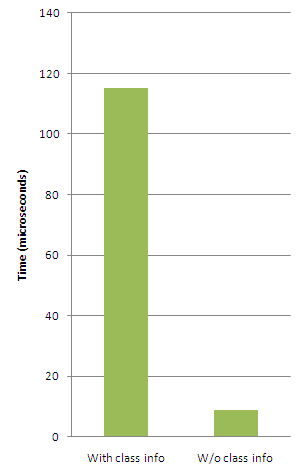 As it turned out, on my computer the logger that produces class information reflectively worked 13 times slower (115 vs. 8.8 microseconds per logging statement, see chart below). Being a Java developer suggests that 100 microseconds is acceptable, but this also means more than 1% of the server time is wasted when logging , let’s say, 100 statements per second. Is it worth it? Somewhat more advanced feature of logging frameworks is Mapped Diagnostic Context. MDC is simply a map managed on a thread-local basis. You can put any key-value pair in this map and since then every logging statement issued from this thread is going to have this value attached as part of the pattern. I need some more complex, multi threaded example to show you the benefits of this utility, so please be so kind and wait for my next articles. What do you think about using MDC in filter to get logs prefixed by e.g. user login or session id. I can always easily grep logs and get user's history of application usage. Your example is probably the most common use case of MDC. I implemented such a behavior in few application and it seems to be very helpful. Logback brings even more sophisticated and unique solution called SiftingAppender that allows to dynamically create different appenders (think: log files) per each MDC value (think: separate file for each user, session or thread). This topic is very interesting and I will definitely write about it some day. I think that during development including the class name really helps, especially in large projects. Makes debugging faster. Possibly in production, due to performance reasons it a good idea to disable it. But even here the context could turn out useful when fixing bugs by looking at the logs.